In the same way that peanut butter and rubber tires were great inventions born of ill-conceived projects, this soup arrived by way of a fortuitously painful batch of jalapeno beer. The first Christmas that we spent as a family in our new home outside of Richmond, VA, Stephanie – after shopping and shopping … and a bit more shopping – came up with the perfect gift for Ryan: Mr. Beer, a kit for the novice beer home brewer. After stinking up the house with a lager brew session followed by a chocolate stout, Ryan branched out, one might say way out, with a jalapeno beer. 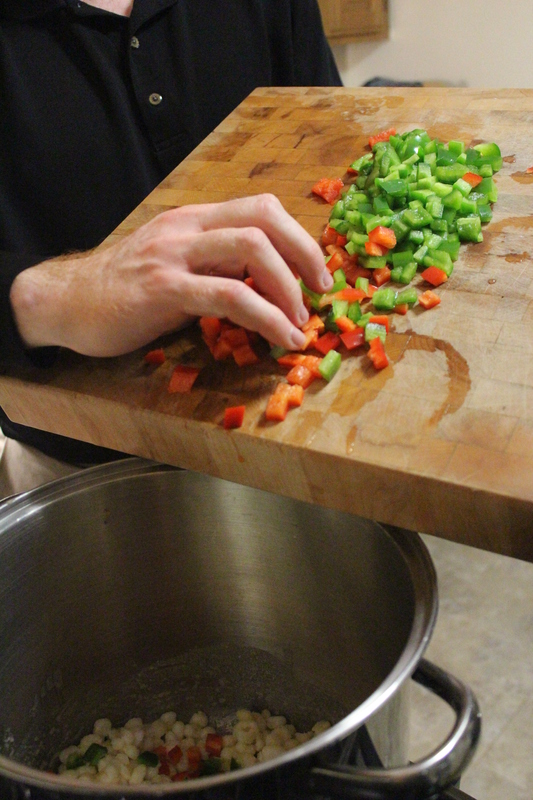 His “recipe” consisted of making one of the kit beers and throwing in “a few jalapenos” for flavor. The painful juxtaposition of ice-cold beer sqelching down your throat with the simultaneous capsaicin burn of a thousand ghost peppers (I am only slightly exaggerating) is an experience that will send your sensory impulses into a tailspin. I briefly entertained the thought that – much like a Lifetime movie-of-the-week – this new bride was being offed by the unmasked pure evil that was the man she married; oh! how could I have been so naive … Well, except for the fact that unmasked pure evil was also turning a sweating vivid shade of red and choking right along with me. After banishing that pain with a right proper mass-produced ale, we sat there and contemplated the napalm beer before us. This wasn’t just any old case of beer that could be tossed without thought. Ryan had gone through the laborious brewing process that took weeks to get to perfection. There had to be some redeeming use for the stuff. His assumption was that spicy food is good … beer in cooking is good … there had to be a recipe that could only be made that much better with his home-brewed two-fer. And Ryan found it in Cooking WIth Beer by Lucy Saunders, a cheddar soup that was just begging for the addition of his spicy beer. Not only was that first version of the soup delicious – if a little hot for a tender tongue – it was the beginning of our Christmas Eve tradition. Scarred by the potato soup days of my youth but desiring an easy dinner to work around Mass and other festivities, we knew this soup had potential: a tasty soup; the perfect quick meal. That Ryan has always made it with no assistance from me is, of course, icing on the cake. 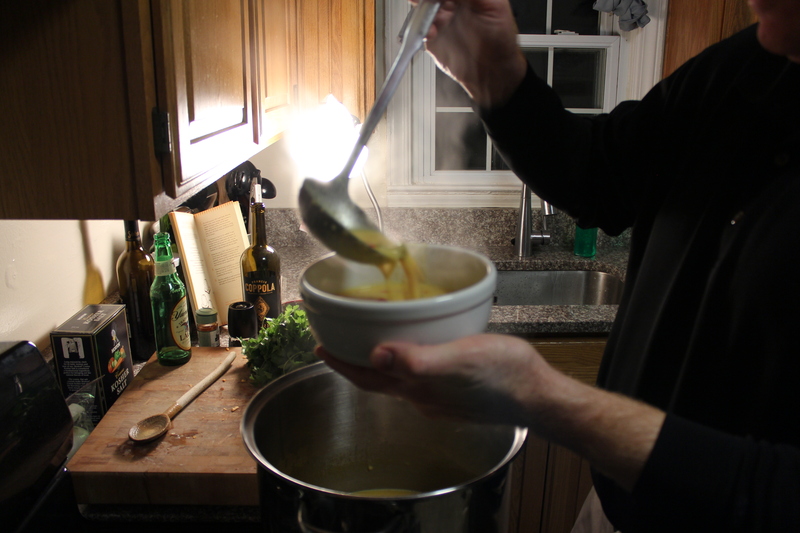 The current version of the beer cheddar soup is a very distant relative of the original and now contains regulated amounts of jalapeno which do play a starring role but don’t overwhelm the other players. It is delicious, festively colorful, and easy to throw together once everything is chopped – which can be done in advance. Paired with crusty sourdough rolls for dipping and a full-bodied red or your favorite beer (natch), it is the perfect cold weather meal. We’ve just celebrated our 10th Christmas Eve with the soup and I am glad that instead of going with my plan B (cleaning the drains), Ryan hit the books and made the proverbial lemonade out of lemons. Enjoy! Step-by-step with photos followed by recipe are below. Open the beer and taste for freshness. Grate cheddar cheese (we use a combo of sharp and extra sharp) and let come to room temperature. 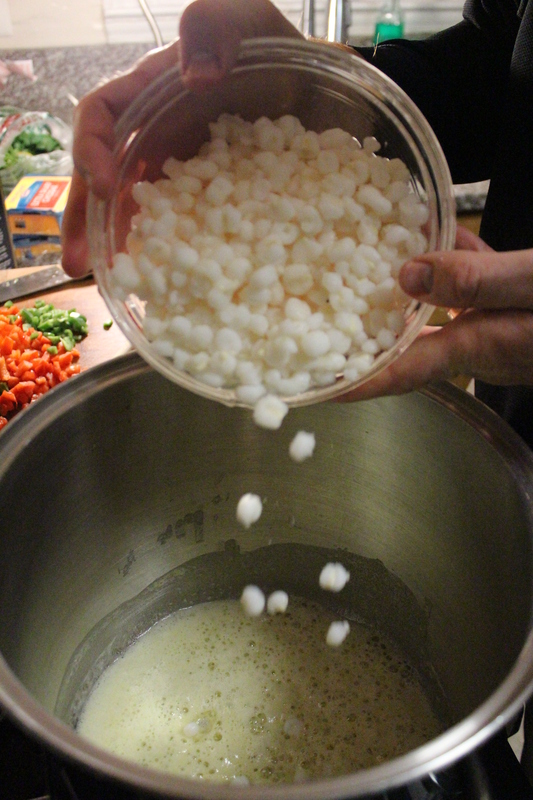 Drain and rinse the hominy. Prep the peppers and onion. The chopped vegetables should be relatively small and uniform in size. Don’t be afraid of the jalapenos! They tame considerably when cooked. My wee tots love this soup so it’s definitely family friendly with one jalapeno. Melt the butter in a heavy-bottomed soup pot over medium heat. 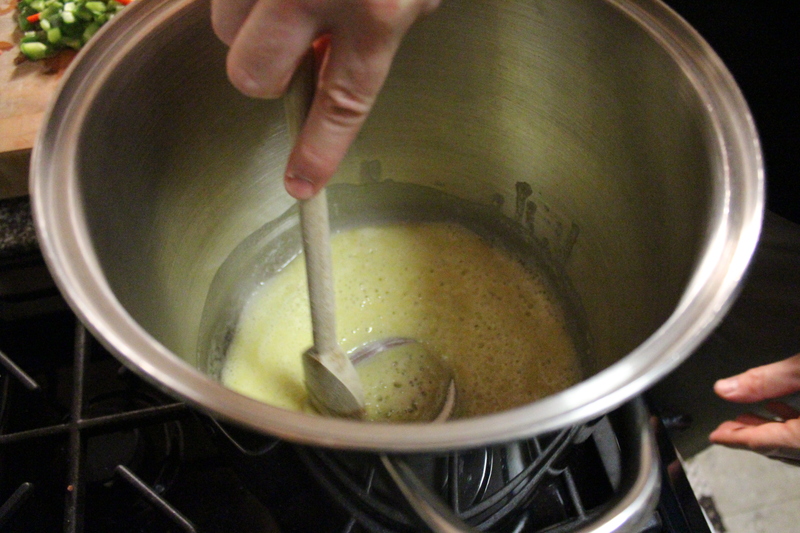 Add the flour and stir until you get a light golden roux (note color to the right – nowhere near brown-brown). Ryan uses a wooden spoon (says Captain Obvious) but you can also use a whisk when making a roux. When the roux gets to pale golden, add the hominy, peppers, and onions. Add the cayenne, salt and pepper. Stir and let cook for 5-8 minutes, stirring occasionally. 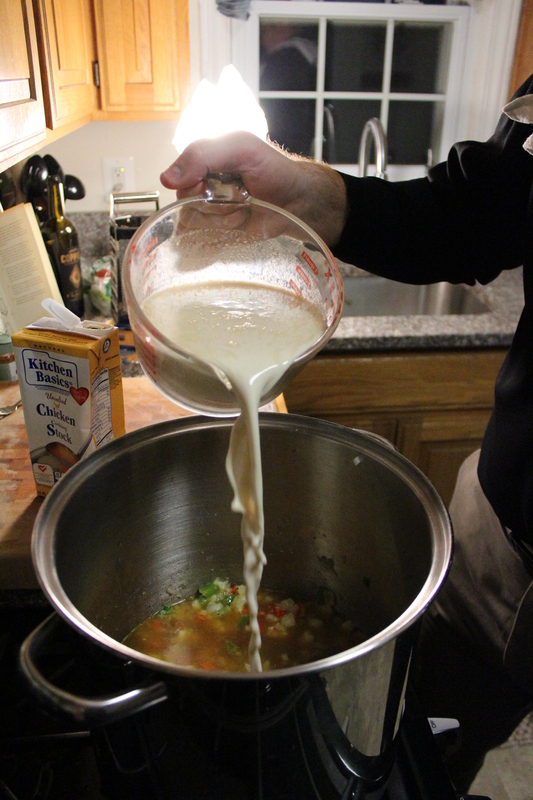 Add the beer, half-and-half, and chicken broth to the vegetables and roux. Bring to steaming but do not boil. Reduce the heat to low. 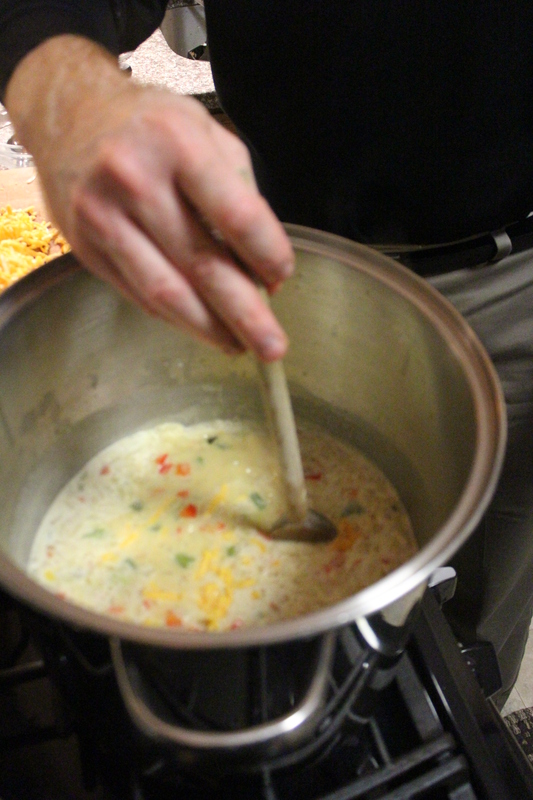 Add the room-temperature cheddar to the soup by handfuls, stirring to combine before adding more. This soup is also my all-time favorite Christmas morning breakfast. While everyone else enjoys cinnamon rolls and sausage (I am not a fan of either), I dip leftover sourdough into just slightly warmed (or not … I’m not picky), deliciously coagulated soup-dip. It’s the simple things, you know? … please don’t be judgy until you’ve given it a try. Bon Appetit! Sit the grated cheese out on a sheet of waxed paper or parchment to come to room temperature. Melt the butter in a heavy nonstick soup pot over medium heat. Sprinkle the flour over the melted butter and stir together. Continue stirring until the melted butter/flour mixture (the roux) just begins to brown to a light golden. Add the peppers, jalapeno, onion, drained hominy, salt, cayenne and black pepper to the roux and cook for 5-8 minutes, stirring occasionally. Taste for seasoning and adjust salt and pepper to taste. Whisk in the chicken stock, beer and half-and-half and bring the mixture to steaming, not boiling. Reduce the heat to low. 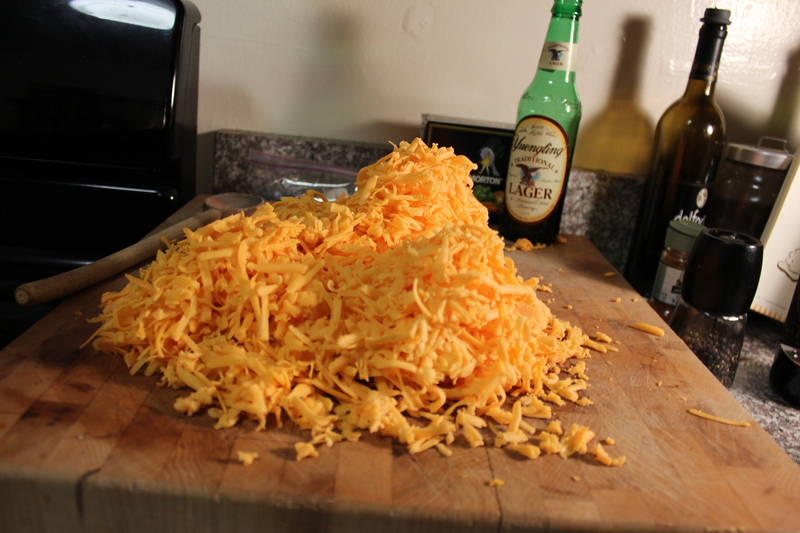 Slowly add the cheese by handfuls, whisking after each addition. Do not let the soup boil or the proteins in the cheese will coagulate. This does not affect flavor but will result in a grainy texture. Have a taste to adjust salt and pepper. 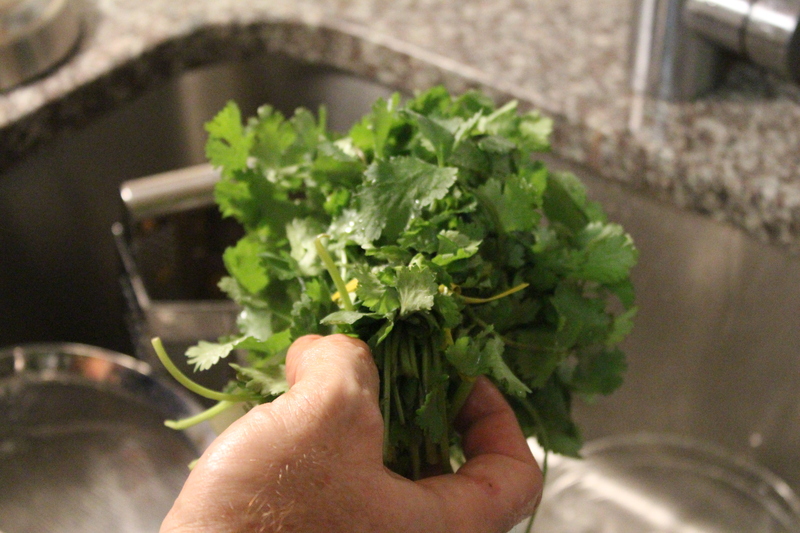 Serve the soup, sprinkling each serving with a bit of the cilantro. This entry was posted in Soups and tagged BD, beer, cheddar, Christmas, Dinner, experimenting, family dinner, hearty, hominy, jalepeno, kitchen, peppers, soup, vegetarian. Bookmark the permalink.